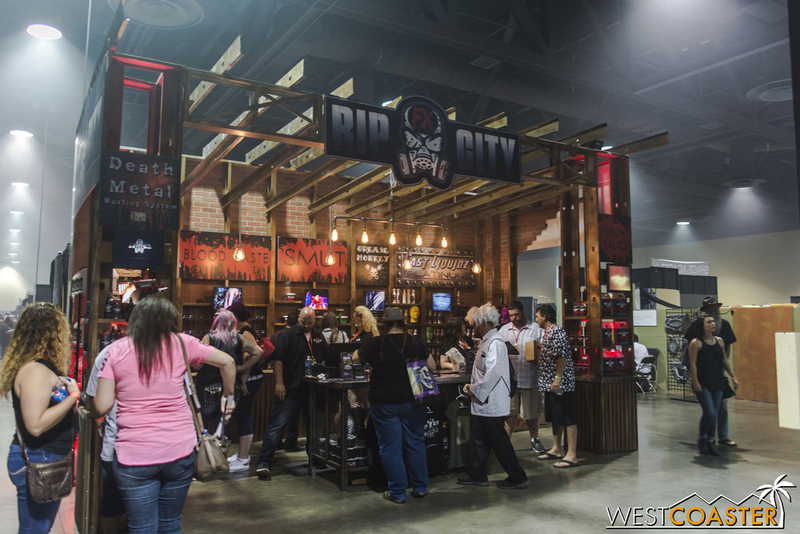 Well, it's been a week-long journey, but we're finally at the tail of our Midsummer Scream 2016 coverage! 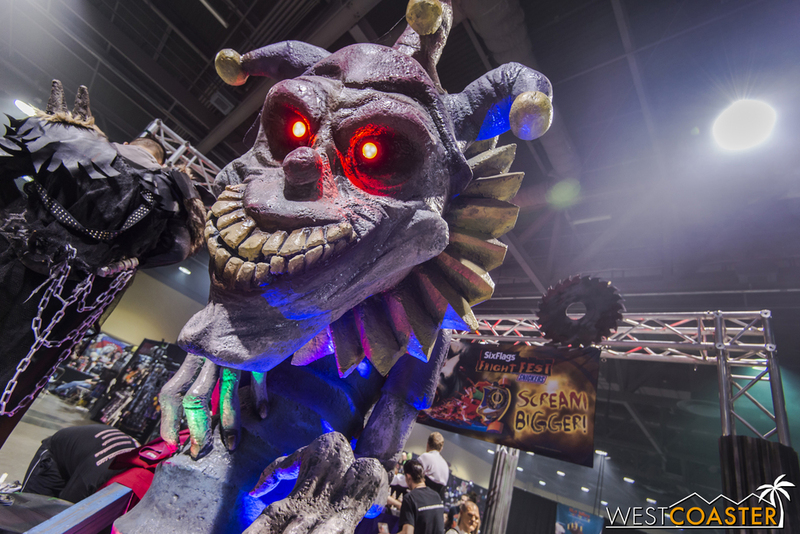 Today, we wrap up the rest of the event by looking at the numerous vendors on the exhibition hall, the fantastic Ghoulmaster's Gallery art exhibit of photos, paintings, and 3D media, and the great fans who dressed up and cosplayed at the event. 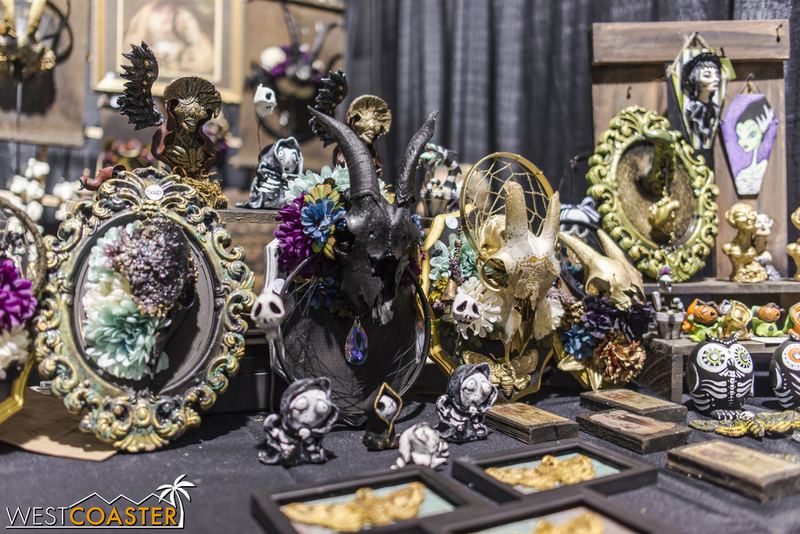 It's great to see Halloween getting the same type of love and big time convention feel that other conventions get, and the success of 2016's Midsummer Scream hopefully means that this type of thing will grow even bigger in the future! Golden hour at the main promenade of the Long Beach Convention Center. 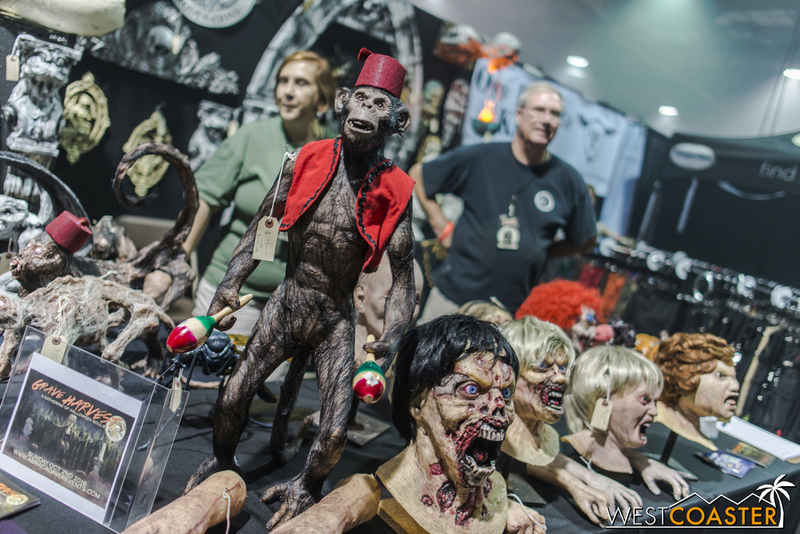 As with any convention, there were plenty of vendors on hand to display and sell their wares. 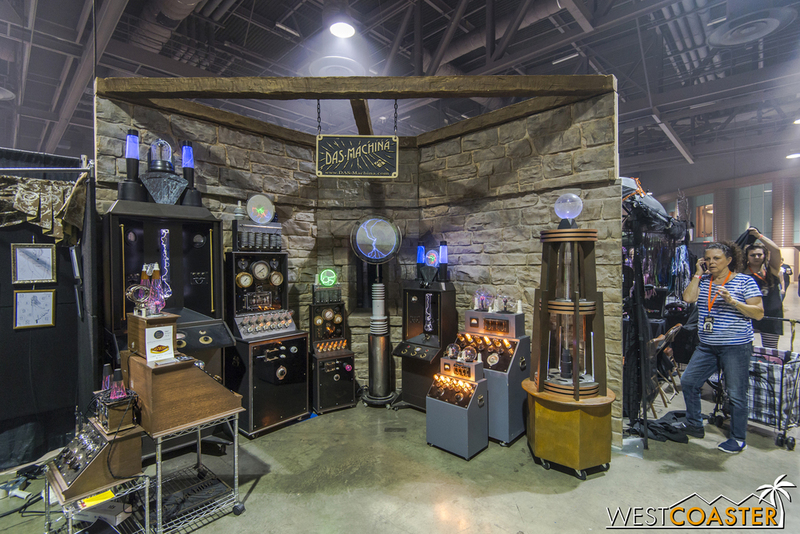 The grand exhibition hall was located on the lower floor of the Long Beach Convention Center, adjacent to the Hall of Shadows. If it was horror-related, it was probably on hand. 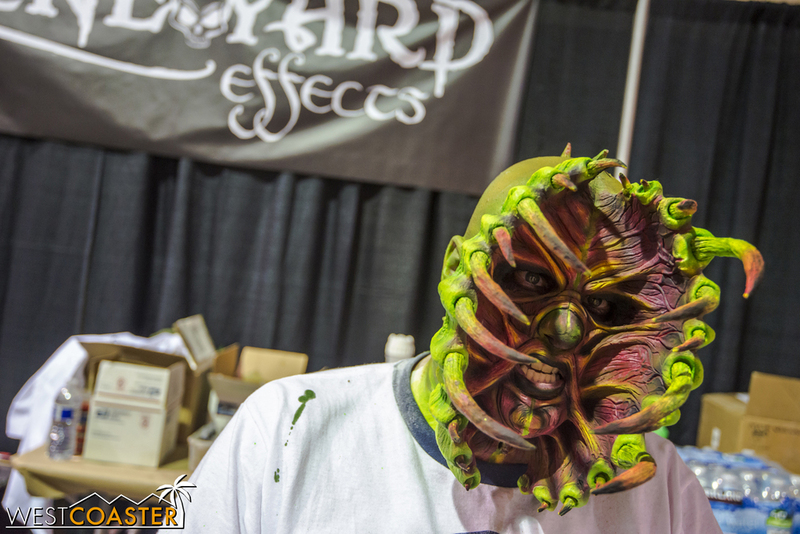 Haunt make up, fog juice, gruesome masks, terrifying figures, gory props, horror-themed sweets and delectables, artwork, costuming, trinkets and accessories, creepy dolls, a miniature escape room, and more! 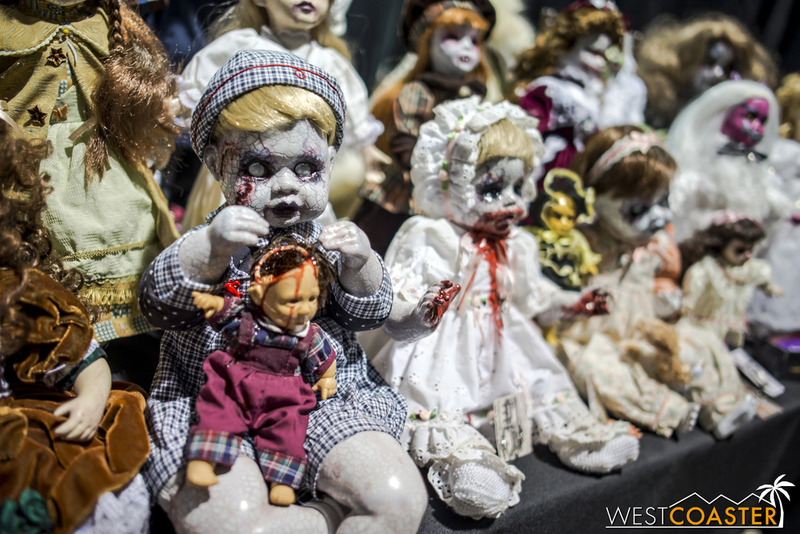 Several haunted attractions also had booths set up to market their offerings for this coming autumn. 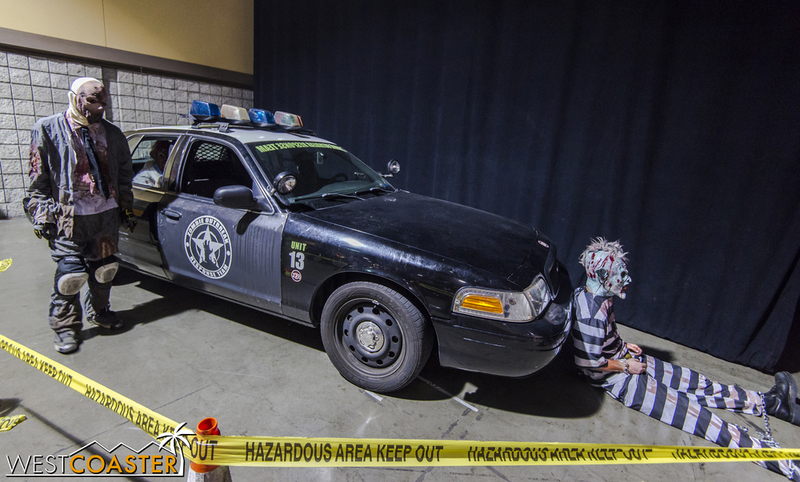 Knott's Scary Farm had a photo op, while Six Flags Magic Mountain Fright Fest had roaming clowns and goons. 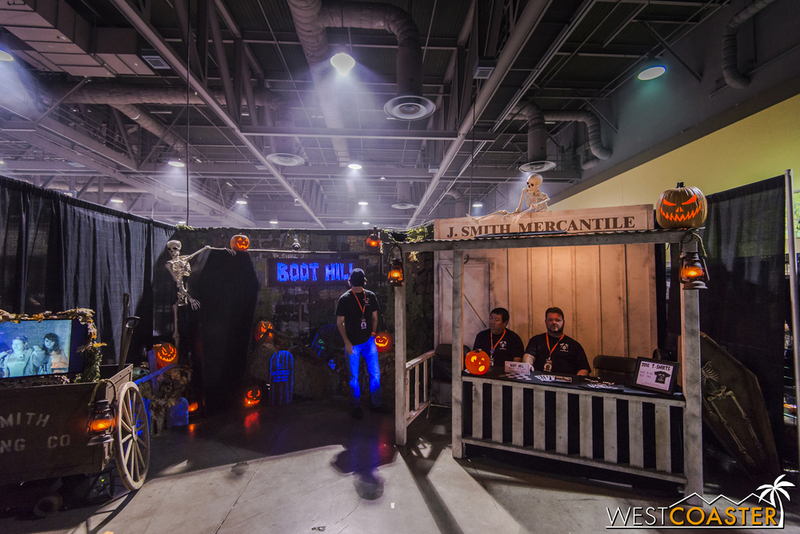 More independent haunts like Reign of Terror, Boot Hill, and Motel 6 Feet Under also had booths. 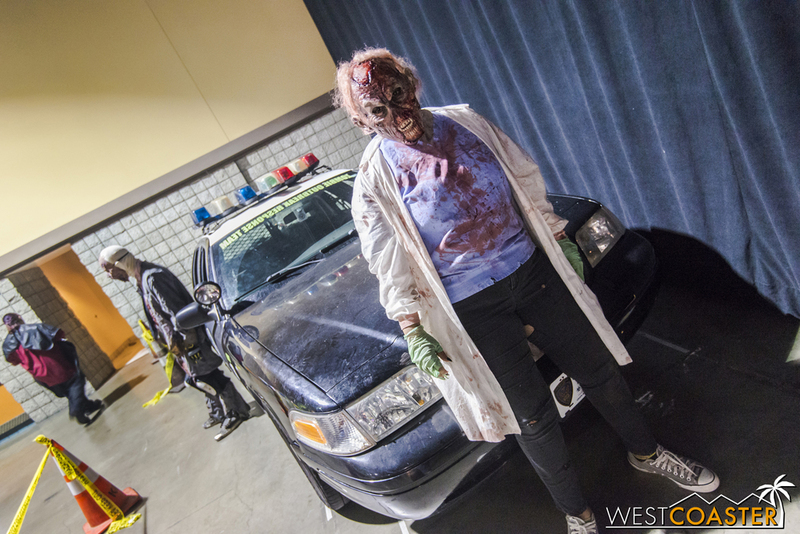 Then there were also some entertainment options--a zombie shooting gallery and an interactive party zone play course, to name a couple. Outside at the main promenade, Kitten Rescue Los Angeles had a black cat adoption booth for people who might be interested in getting a cuddly kitty. 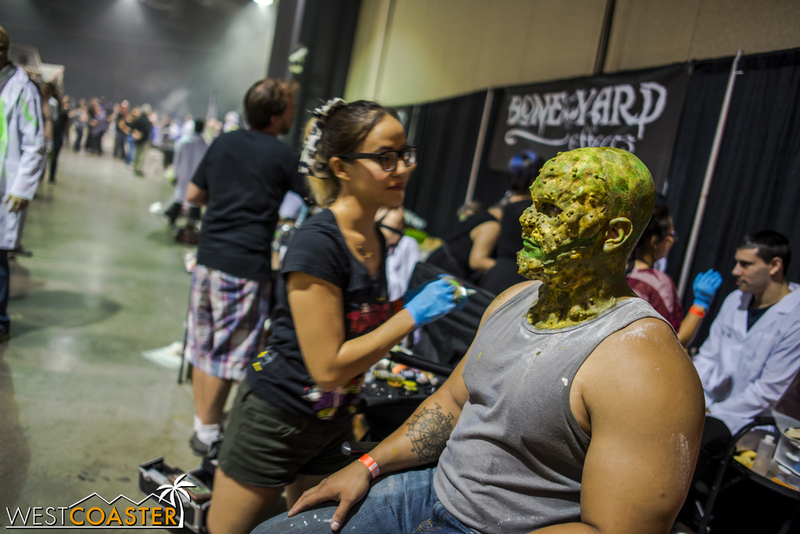 The Ghoulmaster receives make-up inside the Ghoulmaster's Gallery. 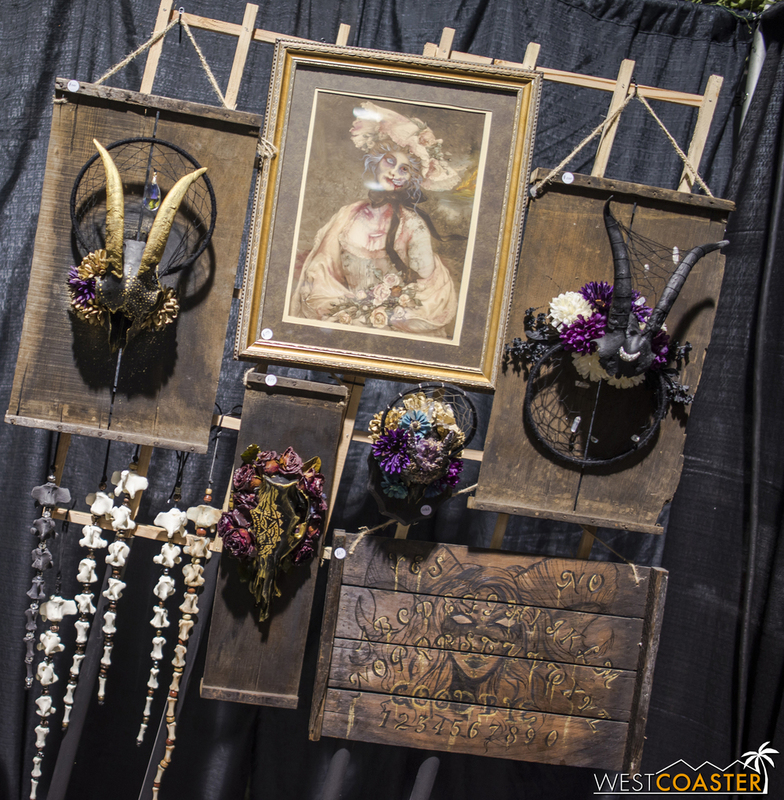 On the main floor of the Convention Center, off the promenade, Midsummer Scream set up a room to display art work taking on a horror theme. 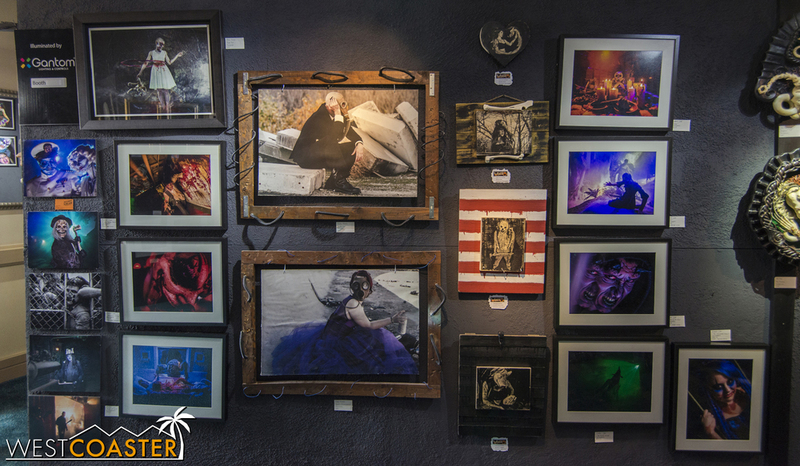 Mocked up as though it had been curated by The Ghoulmaster, this gallery featured an amazing display of artistic talent, with sculptures, figures, paintings, and photography really shining brightly to display creative people's love for Halloween. Although it wasn't prominently advertised, I found it to be one of the really nice features of this convention! The Ghoulmaster with his macabre maidens. 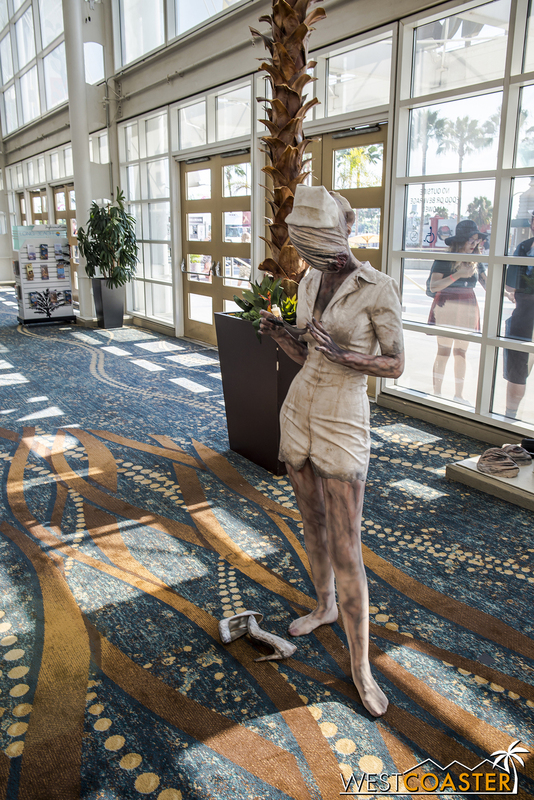 And of course, what I considered the coolest aspect of the Midsummer Scream ambiance was the people. 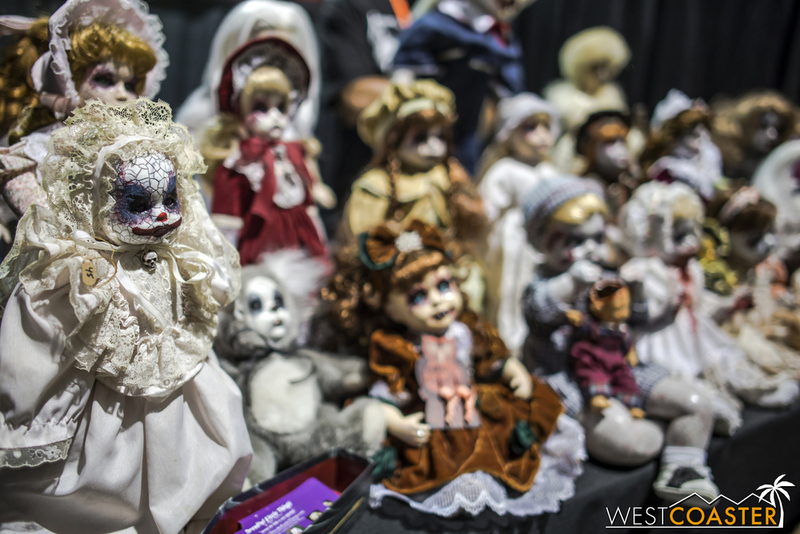 Plenty of guests came in some sort of costume--whether it be a cosplay of an iconic horror movie character or something generic in the realm of horror or in their haunted attraction character--and this added to the devilishly sinister vibe that was perfect for a Halloween convention. 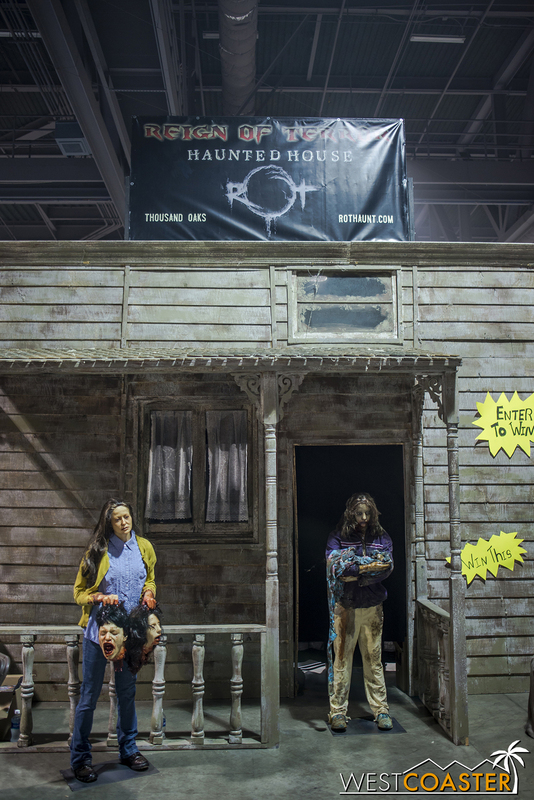 Where else would you find a little girl casually hanging out with Jason Vorhees, or a toddler geared up and practicing slider moves on the floor as guests strolled by? 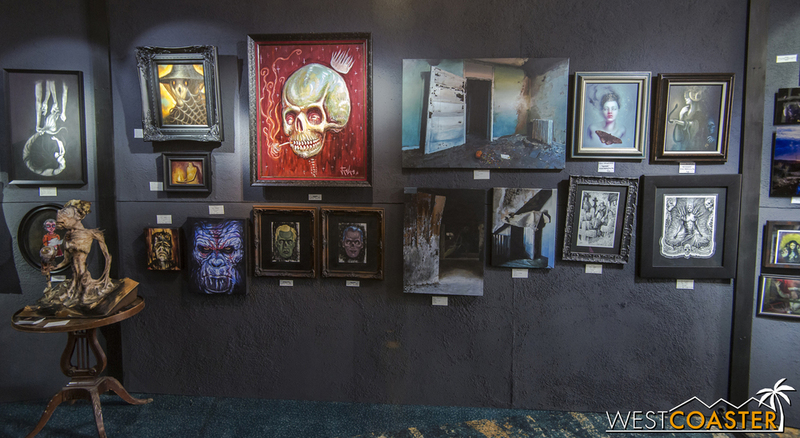 The myriad of creative guests lent a sense of credibility to this first-time event. 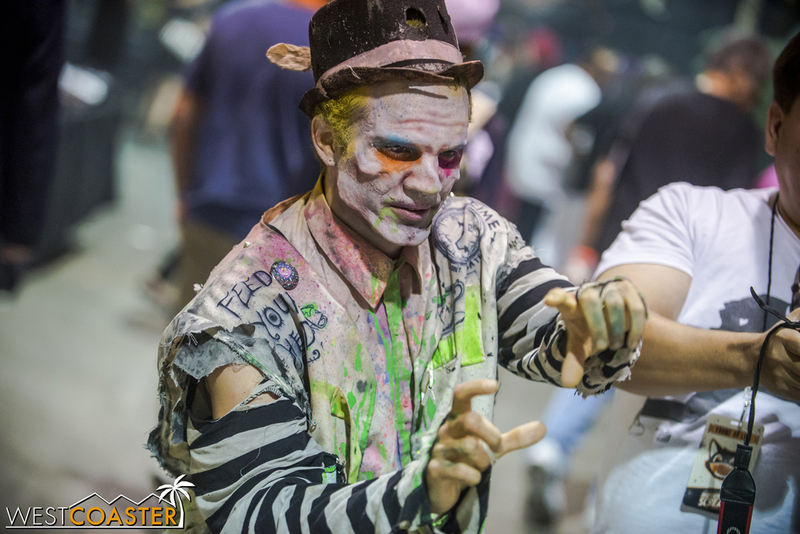 They made Midsummer Scream feel like a "big deal," and it was, because it was a massive celebration of all things Halloween! One particular person I ran into came not just as a character, but also as himself. You'll see two photos of him in the gallery below (warning: one of them technically graphic and nsfw), but his story was fascinating and intriguing. The gentleman introduced himself to me as The Gentleman Zombie, Keith Conner, and proceeded to explain how he and his family of zombies had convened for a little reunion, but at the present moment, everyone was hiding from their dreaded Aunt Mildred, who was a most insufferable dead woman, and so we should excuse him if he should appear a bit rushed, for he was keeping a wary eye on the look-out. And as he went on in this entertaining and thematic spiel, he would take off his fake mustache glasses, revealing a legitimately missing nose. It was a shocking reveal, played off with dry humor and an understated manner, as though he was simply taking off glasses as part of an engrossed conversation. And that was the punchline. 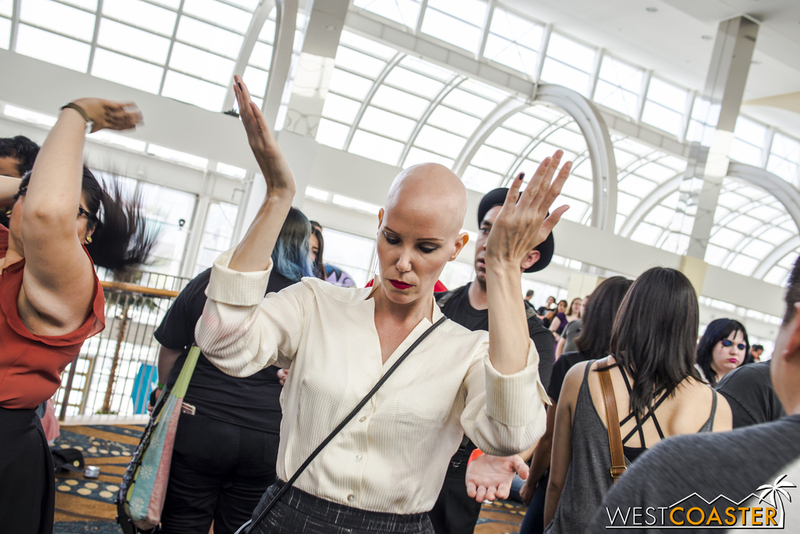 But as I discovered in conversating with this dapper zombie over the course of the next twenty minutes, this wasn't simply a matter of a person using real deformity to play dress-up at a Halloween convention. Keith was also here to meet with industry people and perhaps gain a character gig with an actual entertainment employer. He was a former military man, in the Rangers for over two and a half decades and a drill instructor for his last few years. But a violent accidental explosion forcibly retired him from the armed forces and left him struggling to find direction and even everyday function as a person with a very visible deformity. To venture in public every day and have children point and adults viscerally recoil on a regular basis must be quite taxing, and it was evident in talking to him off character that he had experienced much hardship. He showed me his joke of a prosthetic nose provided to him by the VA--a badly mismatched color piece that only amplified attention. And so, in sort of a way to tackle this head on, he had decided to fashion a character that might turn a negative into a positive and hopefully yield work to provide some form of normalcy. As chance happened to be, while we were chatting, Six Flags Fright Fest head of make-up Scott Ramp happened to pass by, and a conversation quickly developed between the two, wherein Scott was taken aback and impressed by the entertainment of this Gentleman Zombie and asked him to swing by his booth later in the day to talk about possible character gigs. I'm not sure how that ultimately resolved itself, but I left the interaction hopeful that this man who had faced ostracism from society simply due to his appearance--through no fault of his own--could be on the way to an upswing in fortunes. I'll certainly not forget the day I met The Gentleman Zombie, Keith Conner. And that wraps it up for the week! We overran a bit due to personal schedule (i.e. real life) issues, but hey, better late than never. And now, we get to properly start the countdown to Halloween. It's warm and beautiful right now, but soon enough, that fog will start rolling in, and a chill will spread through the air, and it will be the most wonderful time of the year!